SAN FRANCISCO (LOG NEWS SERVICE) — Australia is back in the America’s Cup for the first time since 2000 after a new challenge by Hamilton Island Yacht Club was accepted by San Francisco’s Golden Gate Yacht Club, which remains the defender and trustee of the world’s oldest international sporting trophy. The challenge was filed Sept. 25 by Australian winemaker and yachtsman Bob Oatley and his son Sandy on behalf of Hamilton Island YC shortly after Larry Ellison’s Oracle Team USA retained the America’s Cup by completing a remarkable comeback from 8-1 down against Emirates Team New Zealand on San Francisco Bay. For the past three decades Hamilton Island YC, which is located at the edge of the Great Barrier Reef in Queensland, has run Audi Hamilton Island Race Week, the largest annual regatta in Australia, with some 200 offshore yachts competing in recent years. “We are delighted to have Hamilton Island Yacht Club and the Oatleys leading Australia back in the America’s Cup for the first time since 2000,” said Tom Ehman, Golden Gate YC vice commodore and America’s Cup liaison. Hamilton Island YC will be the challenger of record, helping shape the rules for the 35th America’s Cup along with Golden Gate YC and other challengers. Hamilton Island YC is lead by Bob Oatley, whose succession of yachts named Wild Oats has dominated ocean racing in Australia for years, including having won six of the last eight Sydney-Hobart Races. An Australian team led by Oatley won the last Admiral’s Cup, widely regarded as the world’s top prize in ocean racing. “Given Australia’s previous success in the America’s Cup, the Admiral’s Cup and Olympic yachting, and as proud Australians, we think it is time for our nation to be back in our sport’s pinnacle event,” Oatley said in a statement. In 1983, Australia II beat Dennis Conner’s Liberty to end New York Yacht Club’s 132-year winning streak in the America’s Cup. Australia last challenged for the America’s Cup in 2000, when its low-budget effort was led by skipper Jimmy Spithill, who was then 20. Spithill, who has since skippered Oracle Team USA to consecutive America’s Cup victories, welcomed Australia’s renewed involvement. Spithill was one of four Australians on the 11-man crew of Oracle Team USA, which had only one American on board for the final 14 races. One of the other Australians on the crew was strategist Tom Slingsby, who won one of Australia’s three Gold medals at the 2012 Olympics. Another Aussie Gold medalist, Nathan Outteridge, was skipper of challenger Artemis Racing. Grant Simmer, the general manager of Oracle Team USA, was navigator for Australia II in 1983. Iain Murray, the regatta director for the 34th America’s Cup, lost the America’s Cup to Conner in 1987 and was aboard oneAustralia when it broke in two and sank off San Diego in 1995 during the challenger trials. Appearing with his father on an Australian TV show, Sandy Oatley was asked if they’d try to get Spithill for the Australian team. “We can only hope. But Australia has a lot of great sailors, Jimmy Spithill among them. We also have a lot of great youth coming forward in our Australian Olympic team,” Sandy Oatley said. Spithill, though, spoke of his loyalty to Ellison and his current team. “Oracle Team USA is a fantastic team. It’s been my life the last two campaigns, and winning and defending the cup was amazing,” Spithill told the Associated Press. As defender, Ellison gets to decide where the next America’s Cup will be contested. While Ellison has raved about San Francisco Bay as a natural amphitheater, organizers ran into vocal political opposition, lawsuits and community protests over the public cost of the event to the city’s treasury and environment. Ellison joked last week that the next America’s Cup would be around the Hawaiian island of Lanai, most of which he owns. The Cup could be back in San Francisco, or it could go to Hawaii — or the highest bidder. After Oracle won the silver trophy in 2010, there were reports Ellison was interested in holding the regatta in Italy. Ehman said his club and Hamilton Island YC are expected to have a protocol for the 35th America’s Cup in place by early next year. That document will have the dates, venues, class of boat and other details. “We think it’s going to be three years away, but that also has to be decided,” Sandy Oatley said. 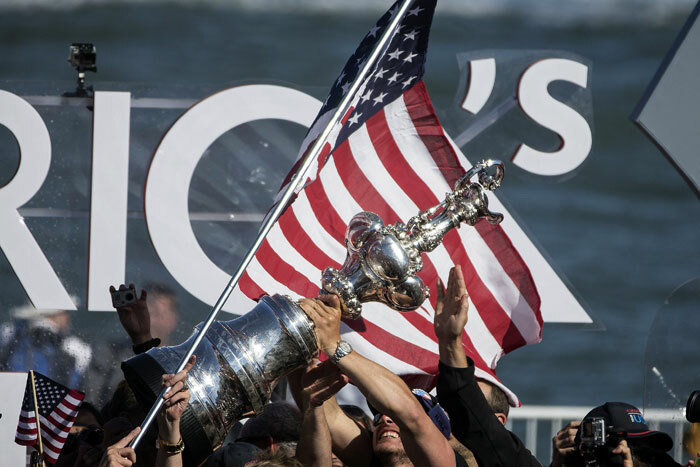 It appears that New Zealand is one step closer to mounting another America’s Cup bid. “While you didn’t achieve everything you set out to, you did win the hearts of this nation,” he said to the thousands of fans. “Not just of our nation, but the hearts of the U.S.A. and everyone else who watched this contest. This country and this government stands ready to be part of the next America’s Cup challenge. Barker said in an interview on New Zealand’s TV3 network that “money doesn’t grow on trees,” and that there was “a lot of work that needs to be done, including where the rest of the money comes from” before New Zealand could consider mounting another campaign.